We’ve all heard of and may even have a bucket list. The idea stems from the movie of the same name and provides encouragement to be intentional in making the things you hope will happen in your lifetime a reality. It’s no surprise that we need to be intentional in romancing our spouse as well. This is by far my favorite topic when it comes to writing about marriage. Living in Florida we look forward to Fall more than any other season of the year. I think it’s because we get so tired of the heat and humidity that we’re ready for a change. The checklist in the photo can be an easy way to start, but read below to find out how you can personalize your own romantic fall themed bucket list! A Computer (for reference purposes) or to create your bucket list as pictured above. Start by researching the events happening in and around your area for September, October and November. Highlight any that interest you. You can do this alone as a surprise for your spouse, or you could turn the making of your list into a date night in itself. Either way, it’s sure to be a fun project. Write the events on your sheet of card stock, using a different color for each event. Add stickers to make your list more colorful. Display your project in a place where you’ll both see if often. Each week, or however often you decide, pick an item off of your list to do. See if you can get through the list before you celebrate Thanksgiving. You could even plan something big as a reward for finishing the list. Need ideas? I’ve provided a list below to get your romantic ideas flowing. Of course, you’ll discover lots of great ideas on the internet that you can add to the list. The most important part is to make the most of every season in your marriage. What a blessing to have a best friend with which to celebrate all the changing seasons of life. Do a corn maze challenge. Listen to a live concert under the stars. Go to a costume party or plan your own. Make s’mores over an open fire. Enjoy a night around a fire pit outdoors. Carve a pumpkin together or compete making prizes worth it for the winner. Go horseback-riding or go on a hayride. Go square dancing, or any other types of dancing you enjoy. Go watch people dance if you don’t enjoy doing it yourself. Go antique window shopping or to garage sales. Have breakfast at your local farmer’s market. Go to an art festival or craft show. Enjoy a fondue for two. Whatever you do, make sure you plan some romance this fall. We’ve waited a while to have nice weather outdoors again–let’s make the most of it! 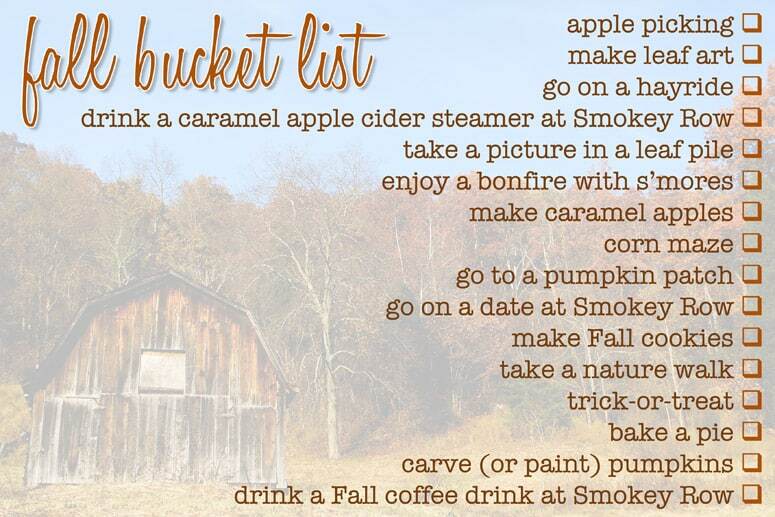 A Fall Bucket List may end up being an annual tradition. Back to school…three little words that can be a relief to hear or a dreaded reminder that your kids are growing and need new clothes yet again! Back to school shopping can be a stretch on any budget and the first ones to take a back seat during this budget crunch are usually the parents. Urgent seasons tend to take our focus off of what’s most important–your marriage–and if you haven’t taken time to plan ahead for the crunch your marriage may go hungry. I’ve come up with a variety of ways to celebrate the back to school frenzy that won’t hurt your budget or cause your marriage to be neglected. Take one idea a day and use to communicate in little ways how important your spouse is to you. Even if you don’t have time or money to go out on the town, you can still make the most of each season in meaningful ways. I’ve broken them down into themes using the subjects of school as my inspiration. Who knows? Your spouse may look forward to school starting again after all. Why not shoot for straight A’s in all subjects?! Using Post-it notes, write words of encouragement to your spouse. Leave them in places where they’ll find them and pray that it’s at a time when they need it most. Buy a card and mail it to them to receive on the first day of school. Give them a book they’ve been wanting to read and sign the inside as to why you chose it. Read aloud to each other. Here’s a great book for teens and pre-teens with short stories that are enjoyable to hear. Make a list of all your favorite firsts you’ve enjoyed together and give it to them on the first day of school. Write them a love letter using Dustin’s guide for making it special. Write adjectives that describe your spouse on the bathroom mirror or shower walls. Come up with a Top Ten List of places you want to go or things you want to do when the kids are grown. Add up all the things you appreciate about your spouse and tell them the sum of your thoughts. Work a Sudoku puzzle together, or have a race and see who can do one fastest. Most kids love this subject best, next to lunch. Plan a game night choosing from our list of romantic board games. Watch a back-to-school movie from this list from Parent’s Magazine. Pick a Fantasy Football team together and make plans to follow your team throughout the NFL season. Don’t forget those 9 week report cards where you reward your spouse for all the ways they’ve achieved success in your eyes. 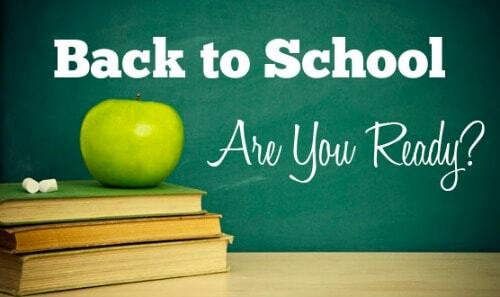 Back-to-School–It’s not just for kids anymore! Every Day is a Holiday – Who Knew? 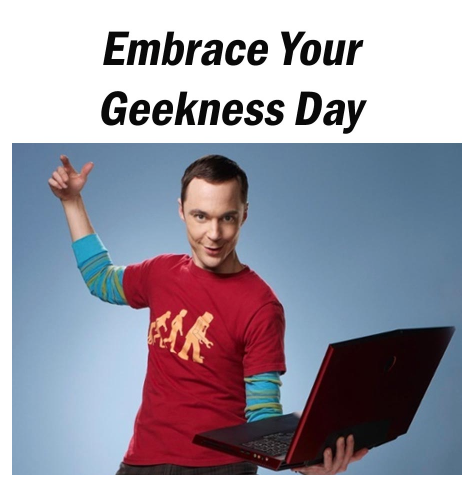 I bet you didn’t know that today is Celebrate Your Geekness Day, did you? Most likely you didn’t because it’s an unusual holiday invented by people who have too much time on their hands. I love holidays. I love parties. I love celebrating and making my husband smile. Yes, I’m the hopeless romantic, but I don’t prefer that term. It makes it sound like romance is a negative, when in fact it’s the opposite. Romance is like a breath of fresh mountain air on a hot, steamy Summer day. It refreshes your relationship in a way nothing else can. In my years of blogging and writing neighborhood newsletters I’ve discovered there are websites focused on helping you celebrate just about any day of the year in fun and unique ways. When was the last time you planned something unusual and fun for your spouse? If you can’t remember it’s been too long. There’s nothing like a party for two to help re-ignite the romance in your home. I challenge you to select a date on the list below and go all out in celebrating the day. Be creative. Be thoughtful, but most of all be romantic! 17 – Peach Ice Cream Day – Go out for your favorite or make your own. 22 – Hammock Day – If you have a hammock for two, plan some time to do some nothing together. 26 – All or Nothing Day – Let your imagination go wild with this one, make it a Deal or No Deal game for two. 7 – National Lighthouse Day – If you live near the coast, plan to visit one and climb to the top. If you don’t, try playing flashlight tag in your house with all the lights off. 9 – Book Lovers Day – Plan a date at a local bookstore and see who can find the oldest publication, the funniest title, the prettiest cover, the most interesting topic, etc. 10 – National S’mores Day – Who needs an explanation on this one. Have fun like kids again! 18 – Bad Poetry Day – Have fun making silly rhymes and texting them to each other. As you can see there are all sorts of crazy holidays you can celebrate together. The most important reason to do this is to help keep your relationship from getting predictable and boring. Check out this website to discover more holidays for every month of the year. All marriages get to a place of routine. It happens because life demands it. But there is one word that will interrupt this routine and hopefully make your spouse smile. What is this one word? Think about it. 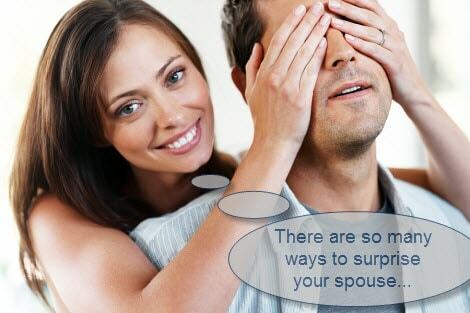 When was the last time you were truly surprised by something your spouse did? It most likely left a lasting imprint on your heart because it was unexpected making it even more special. Even if the surprise was little – like your favorite treat – it still meant a lot. To help you plan a sweet surprise of your own, we’ve come up with a list of Romantic Surprises to Make Your Spouse Smile. Try one or try them all. The important thing is that you’re creating cherished memories your spouse will hold on to forever. That makes it worth the effort! Please your spouse sexually in a way you know they’ll like, but won’t expect because you’ve never done it before. Arrange for a babysitter and plan a date night out without telling them until the babysitter shows up. Mail them an invitation to meet you somewhere later that day. When they get there have another envelope leading them on a hunt for you. Plan a day of all their favorites – food, drinks, activities, movies, friends, etc. Include as many in one day as you can. Give them a full body massage. Let them listen to romantic music with a headset to increase the relaxation. Mail them a steamy card at work, or send them one via text or e-mail. Add some lingerie to the card and really wow them. Set up a tent in your bedroom or on your bed and have fun “camping indoors” together. Drive to your spouse’s work and put his/her favorite cold drink and snack in their car with a card telling them to drive safely. Complete a big task on your spouse’s to-do list and don’t tell them you did until they discover it themselves. Listen to your spouse’s cravings and then do whatever you can to get it for them. For instance, You hear them say, “I want something sweet”. Get up and start baking them cookies without telling them what you’re doing. Celebrate an unknown holiday. Check out the list here. (Listed according to month). Today just happens to be “Best Friend’s Day”. Can you think of more ways to make your spouse smile? I’d love to hear them! I challenge us all to make the most of the summer by filling it with unexpected pleasures for our love. Until next time…Keep the romantic fires burning! The time when we look forward to enjoying life outdoors and lots of sunshine. Instead of letting this summer flash by in a blur of kids activities, trips to the pool and a few family barbeques, set aside some time on the calendar to enjoy with your spouse. 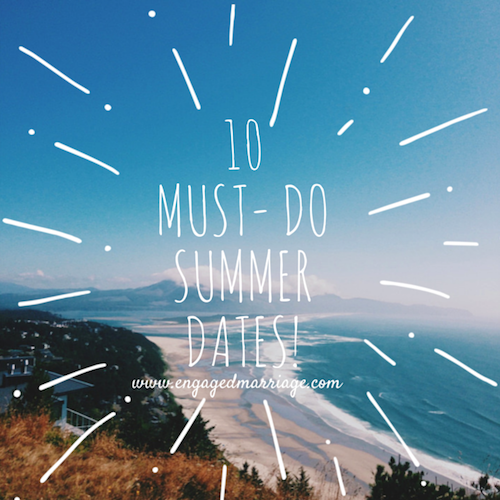 To help you out, I thought it would be fun to share 10 awesome Summertime Dates that are easy and very romantic. Pick your favorites and make it a point to give them a try before school begins…it will be here before you know it! Whether you have an outdoor fire pit in your own backyard, or you know of a place in your town where they have one, I encourage you to plan an evening to sit by the fire after sunset and reminisce. Talk about your favorite summer vacations growing up, or discuss places you dream of visiting one summer in the future. You might even want to start your own vacation Bucket List, which is basically places we’d love to see in our lifetime. Everyone has enjoyed a picnic together at one time or another. But why not take your picnic to another level? Surprise your spouse by fixing a picnic and meeting them in their parking lot at work. Tom did this last one for me when I worked at a private high school campus. He set up a table behind our car with the lift gate open so I could hear the music playing from his CD player. It was a day I’ll never forget! This could include a trip to a local water park, or spring. You could go kayaking, rafting, canoeing or snorkeling. Whatever is near you. The guys are sure to like this one! Plan a trip to your local ice cream parlor and enjoy your favorite. Or you could do this one at home making ice cream sundaes. If you’re really motivated you could make your own ice cream using an ice cream maker. Nothing says summer like some delicious ice cream! Take your bikes and hit the trail together. Pack some snacks and drinks with you, and look for a secluded, shady spot along the route. Stop and enjoy being alone in the woods together. Variation on this would be to go hiking – leave the bikes at home. But don’t forget your bug spray and sun screen! Visit your local farmer’s market and buy ingredients for your dinner date at home that night. Once the kids are in bed, cook up your fresh ingredients while watching movies that highlight farmers’ markets: Sleepless in Seattle (famous Pike Place Market) or You’ve Got Mail (New York City) to name a few. Buy all the right tools to make a fantastic sandcastle. You can either work together to build your mansion, or build separately and have a vote for the best. You could ask those passing by to cast their vote, or take pictures and put them on Facebook and have your friends vote for the best. Finish this date by knocking the castle down and burying each other in the ruins. There are many games available that would be perfect for a little one-on-one challenge. Yard darts, horseshoes, hillbilly golf, corn hole, croquet, badminton or bocce ball. Check out Amazon for lots of varieties and find a couple that you know will be great for your tourney. Make the games more fun by adding your own incentives for the winner…use your imagination here! Check your local listings to see what concerts are taking place in or around your town. Summer is usually full of such opportunities and gives you the chance to hear bands you might not hear otherwise. Whether it’s an orchestra, a local cover band or a national act at the regional amphitheater, a concert under the stars can be fantastic. I remember growing up it was popular to take a Sunday drive. There was no destination other than to enjoy the scenery as well as the time together. Check out one-tank road trips near your home and make plans to spend a day driving and talking. There is no better way to slow down and enjoy each other. There you have it! Ten great dates to try at some point before Labor Day. What is your all-time favorite summer date? I love the scene in Toy Story when Mr. 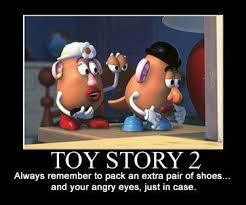 Potato Head puts on his angry eyes. Those are classic scenes that make us laugh. Wouldn’t it be nice at times if we could hand-pick the eyes we want to express the emotion of our choice? We probably do this already, but not consciously. As the years pass in marriage it’s easy to become lazy and look at our spouse in the same way day after day. This is why romance is vital to a healthy marriage. It helps us put on different eyes to see our spouse the way we did when our love first began. Back then My Eyes Adored You, to use the title of a popular love song. Do you still adore your spouse? Or have the cares of life and the responsibilities of parenthood and careers robbed your vision? Below are some ways to help you regain those romantic eyes. Try one or try them all. See if it doesn’t spark some fresh affection. 1. Watch your wife as she takes a shower. Remember what it was like when you saw her naked for the first time. 2. When your husband reaches for your hand, think of all his hands do to lead, guide, love and protect you. And consider how hard he works to provide for you and your children. 3. When in a crowded room, look for your spouse and make eye-contact. Let the look linger and enjoy it. 4. Try looking in each others eyes for one minute without saying anything. Let your eyes express your affection. 5. Listen while looking at your spouse when they’re talking to someone else. Give thanks for the ways they express themselves and their ability to cultivate friendships at work, church and in the community. 6. Watch your spouse play and interact with your children. Step back and appreciate the sacrifices they’re willing to make in order to raise healthy and happy children. 7. If your spouse is strong in a certain area take time to observe them doing what they do best–whether it’s serving, entertaining, counseling or evangelizing. 8. Watch your spouse as they sleep. Appreciate the blessing it is to share a bed together, to know the rhythms of rest, and the patterns that make them unique. 9. Watch your spouse do something they love to do, whether it’s yard work, playing an instrument, watching or playing their favorite sport, joking with friends, and pay attention to their expressions as they do it. 10. Observe your spouse doing a mundane task like clean the kitchen, shave or make coffee. Notice how they do it and how different they are from you. Rather than let this be an annoyance, be grateful for how your lives have intertwined in such unique ways. After you’ve spent some time observing your spouse with fresh eyes, plan some time and share with them what you’ve noticed. 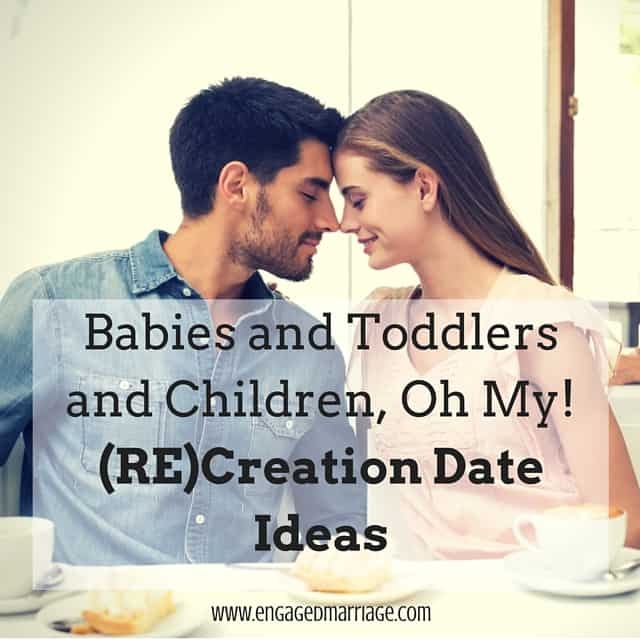 You can go all out and make it a date night, or talk around your kitchen table after the kids are in bed. The key is to communicate clearly to your spouse how you see them. If you’re uncomfortable talking about it, try writing out your sentiments in a card or love letter. And when we do romance is usually the first thing to get pushed aside. I hope you won’t let your love wane, but will instead be intentional all the years you have together. Then, when the end of your life comes there will be no regrets, only precious snapshots of a love that lasted a lifetime. Time For A Romantic Tuning? I’ve inherited my parent’s player piano, something for which I’m grateful because of the memories it holds for me. But when I play it something is wrong, very wrong. The notes seem off a bit, and they are. After moving this heavy piece from my Mom’s home to ours it lost it’s tune. I can put in a roll of one of Dad’s favorite songs and it sounds as if it’s dragging, even the upbeat tunes sound tired and worn out. The good news is this old piano hasn’t lost it’s music, it just needs a tune-up. Once the keys have been set to their proper pitch the old songs will be like new again. How do I know? I’ve had it tuned before and the process is fascinating. This is like marriage as well. Life has a way of beating us up all day long, then putting us back in our homes as the sun sets, exhausted and weary. We do what we can to connect in the short time between dinner and bedtime, collapse in each other’s arms only to repeat the entire process again tomorrow. It’s hard to be in tune with each other when we’re being pulled in different directions all day long. This is why being intentional in romancing each other is a must. Have you lost your ability to express your love in thoughtful ways? I’m certain you haven’t lost your ability, you simply need a tune-up, so to speak, to get the music of romance sounding lively once again. 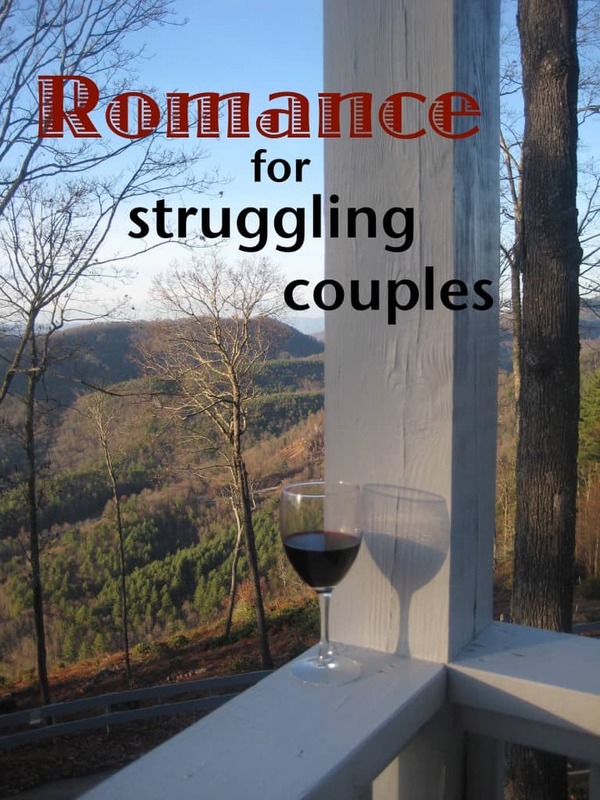 We all need this and this is why I write about romance in marriage here each month. It’s sort of like a monthly tune-up. 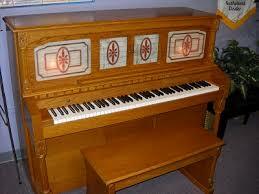 There are 88 keys on a standard piano, and each one has it’s own note to play. It can’t be tuned to sound like the note next to it or there would be no harmony. Each note is unique to itself, yet it has a place among all the other notes. So it is with date nights and romantic kindnesses. Each one is unique and provides a new depth to the harmony of our marriage. It is a gift to be able to reach the place in your relationship where you make beautiful music together, to borrow an old adage. How is the music in your marriage? Is it tired and weary? Maybe it’s time to do some research and discover what area of your spouse’s life needs attention. It could be encouragement on how they’re doing in the parenting department. It could be they need to lighten up and spend an evening laughing. It may be a night of dancing together would do the trick. The key is (pun intended) to find out what your spouse needs to remind them of your love and care, and then do all you can to make it happen. Last year I hosted a ladies retreat and one of the ladies who came did so because her husband insisted. They have 6 children whom they home-school, so she was obviously in need of some alone time with girlfriends and with the Lord. This retreat provided both. Her husband sending her away for a week in the mountains was more than enough for her to know he loved her, but he didn’t stop there. A couple of days into the retreat she received a delivery from the UPS truck. It was a box of her favorite pumpkin spice coffee creamers because he knew how much she enjoys an afternoon treat. 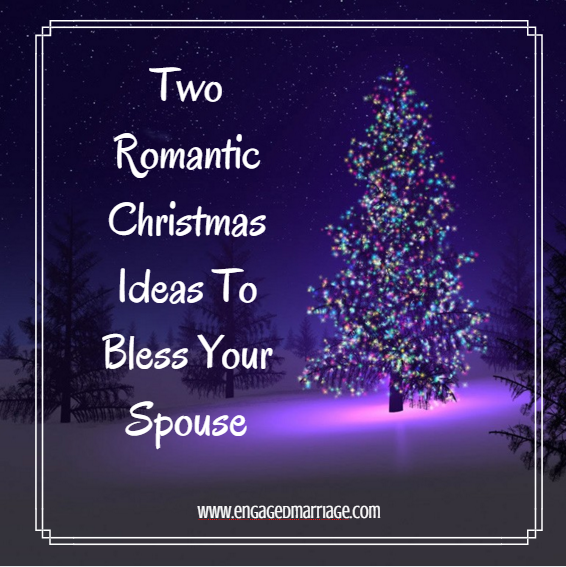 She was overwhelmed at his thoughtfulness, but he didn’t stop there! Yes, two days later the UPS truck pulled up again with another package for her. This time it was a beautiful afghan to wrap herself in as a warm hug from home. All the ladies oohed and aaahed. I’ll never forget the look on her face. This dear wife was the recipient of thoughtful and romantic gifts of love from her adoring husband. The gifts didn’t cost that much, but what they expressed to her was priceless. When was the last time you purposed to bless your spouse in this way? Take some time and study where they are struggling right now. Listen and pay attention, like those who tune a piano. See which notes are in need of tweaking, and then do something creative to show your love and care. This is what a healthy marriage looks like, and when we play together in such perfect harmony, our children will notice and want to join in the song. While I’ve been writing this post, I keep thinking of the lyrics of an old song by Paul McCartney and Stevie Wonder titled, “Ebony and Ivory.” Listen to the lyrics and apply it to your marriage. I always say there’s a song for everything…this one is another example. Oh, and guys–don’t forget Mother’s Day is approaching soon. Why not start planning something special now. Check out our ideas here.